Getty Images/Joe RaedleVehicles trapped under the collapsed pedestrian bridge that was newly built over Southwest 8th Street allowing people to bypass the busy street to reach Florida International University in Miami. 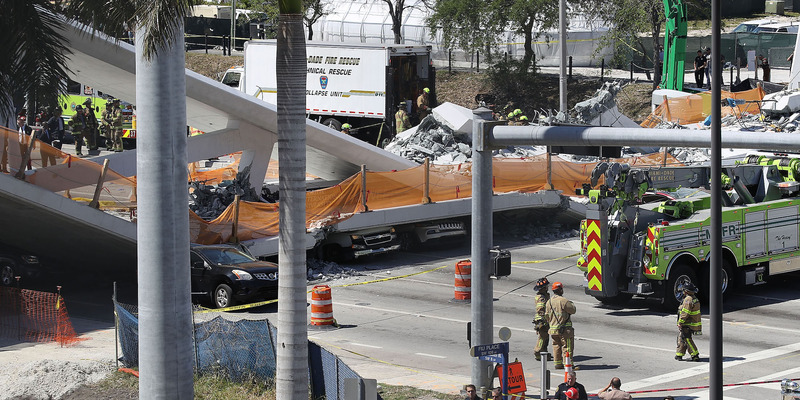 A pedestrian bridge in Miami collapsed Thursday, killing six people and trapping eight cars underneath. Miami-Dade officials said nine people were transported to hospitals. Search-and-recovery efforts continued on Friday, but authorities told media they no longer believed they would find anyone alive. 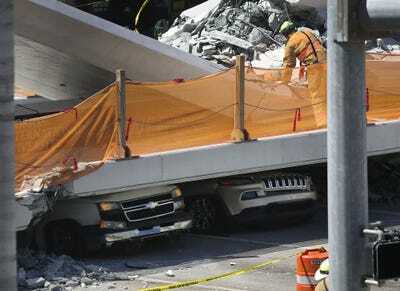 Six people are dead after a newly installed pedestrian bridge in Miami, Florida, collapsed on Thursday, instantly crushing eight cars under 950 tons of concrete and triggering a massive search-and-rescue effort that went on through the night. Recovery efforts continued on Friday, but Miami-Dade authorities said they no longer believed they would find survivors. “Our primary focus is to remove all of the cars and all of the victims in a dignified manner and not compromise the investigation in the process,” Miami-Dade County Police Chief Juan Perez said at a press briefing. At least nine people were transported to hospitals after the collapse, Miami-Dade County Fire Chief Dave Downey told reporters Thursday. At least one of the dead victims was a student at Florida International University, Sweetwater Mayor Orlando Lopez said. The overnight search-and-rescue effort required searching under the slabs of concrete stretching across the eight-lane highway, with more than 100 firefighters on the scene along with technical rescue workers, search dogs, and cranes. Rescuers used heavy equipment to move parts of the bridge little by little, creating “safe zones” in which they can work, Miami-Dade Fire Rescue Division Chief Paul Estopinan said. Now that no survivors are expected, authorities said the ongoing excavation efforts will move more slowly and carefully. Perez said Thursday the police department’s homicide bureau would take the lead in investigating the incident, adding that the state attorney was standing by and ready to assist. He said it would most likely take days before a cause for the collapse could be determined. Perez added that anyone worried about their missing family members or loved ones in the area could call 305-348-3481 for information. WTVJ NBC6 via Associated PressEmergency personnel responding to people near the collapsed pedestrian bridge at FIU on Thursday. The bridge, near the FIU campus, was erected Saturday in a matter of hours, using a method called Accelerated Bridge Construction intended to speed up the installation while minimising traffic disruption. It was built to connect the university campus with the city of Sweetwater, allowing students to cross safely over the busy highway safely. The bridge was scheduled to open to the public in 2019, FIU said in a press release. The National Transportation Safety Board sent a 15-member “go team” to investigate the collapse. NTSB Chairman Robert Sumwalt said the team arrived around 10 p.m. on Thursday and did a walkthrough of the scene. Sumwalt said the team would likely stay for five to seven days to determine how the bridge collapsed and make recommendations on how it could have been prevented. He added that the NTSB team is not involved in the homicide investigation. “Our entire purpose for being here is to find out what happened so that we can keep it from happening again,” Sumwalt told reporters on Friday. “The most important thing we can do right now is pray for the individuals who ended up in the hospital, for their full recovery, and pray for the family members who lost loved ones,” Gov. Rick Scott of Florida said on Thursday. 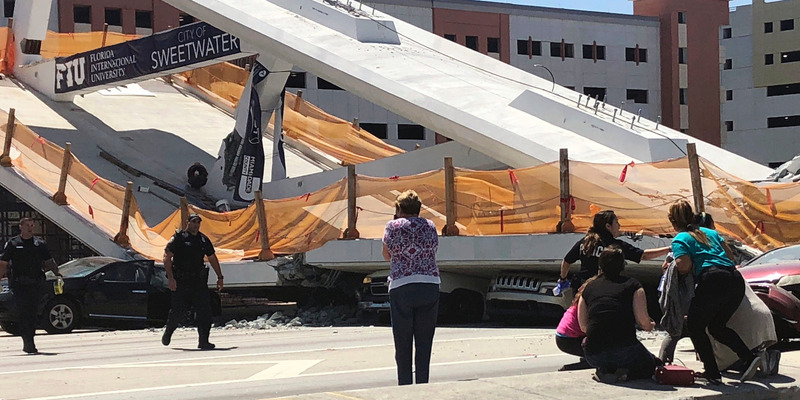 “The road under the collapsed bridge is heavily used by so many people in #Miami This is such a horrifying tragedy,” Sen. Marco Rubio of Florida, a former adjunct professor at FIU, tweeted. Getty Images/Joe RaedleVehicles trapped under the collapsed pedestrian bridge. FIU released a statement Thursday afternoon saying university officials were working with the police and first responders. Just days earlier, the university tweeted a quote from Rosenberg about the newly constructed bridge. “FIU is about building bridges and student safety. This project accomplishes our mission beautifully,” Rosenberg said. That tweet has since been deleted. Officials had praised the quick completion of the bridge, which reportedly finished weeks ahead of schedule. Its construction was part of a $US19.4 million project grant partially funded by the Department of Transportation, NBC 6 reported. Both Figg Engineering Group and Munilla Construction Management, which had partnered to design and build the bridge, released statements expressing condolences and vowing to investigate what went wrong. But media outlets were quick to point out that Figg had been involved in bridge collapses. One bridge project collapsed and fell 40 feet onto railroad tracks during construction in June 2012, The Virginian-Pilot reported. Munilla was sued earlier in March over allegations it had caused the injury of a Transportation Security Administration employee at Fort Lauderdale-Hollywood International Airport as a result of “shoddy work” on a bridge, The Miami New Times reported. Footage from TV networks showed firefighters and other rescue workers rushing to recover victims.